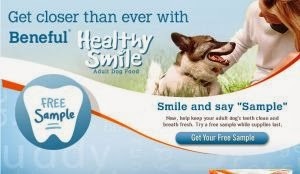 Smile and say "Sample" To help keep your adult dog's teeth clean and breath fresh. Try a free sample while supplies last. Click the link below to go to the Beneful Facebook page. Once on their Facebook page, "like" them then click on the blue "get your sample" button.